Paul and I just wanted to take a moment, and thank you for helping to make our wedding so amazing. All the food was a huge hit and your staff was so friendly and hard working. We couldn’t have asked for more from you all. Also, thank you for staying and making sure everything went so smoothly. We have left a wonderful review of your business on Yelp and will definitely recommend your services to our San Diego family and friends. Hi Terry, Wanted to take time & thank you as well for the outstanding service. Gabrielle’s graduation party was a huge success! Eric did an awesome job, and everything was perfect from start to finish. The BBQ was a big hit & all the guests raved about the food. Eric’s attention to detail from set up to clean up was so appreciated. Gabrielle was so happy with it all! She loves BBQ and she enjoyed the food immensely! Have a great summer and continued success. Thanks again. Amazing catering and DJ for my wedding! 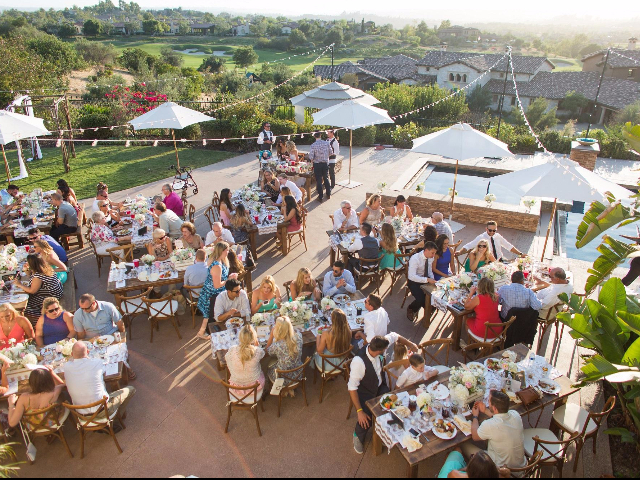 My husband and I hired RAC to cater and DJ our February wedding, and we are so happy we did! 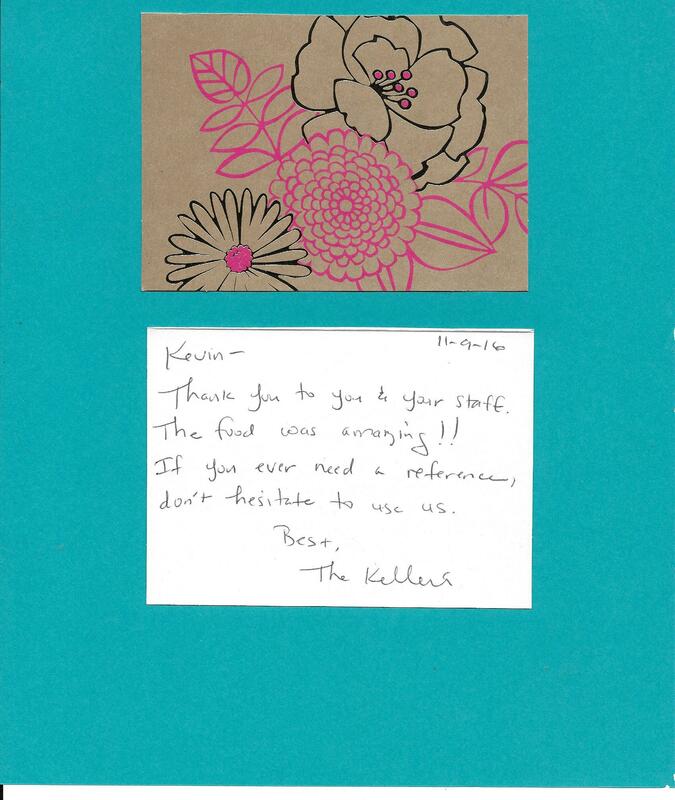 Kevin and his staff were so friendly throughout the entire wedding planning process. They were always easy to get a hold of and quick to reply to emails and phone calls, and very kind and patient. Our wedding was at Old Poway Park on what turned out to be a very rainy day. As we had originally planned on having our ceremony outdoors, Kevin and his team were flexible and well-prepared to make a last-minute change to an indoor setting due to the heavy rain. I was not stressed at all, knowing that everything was in good hands with them. 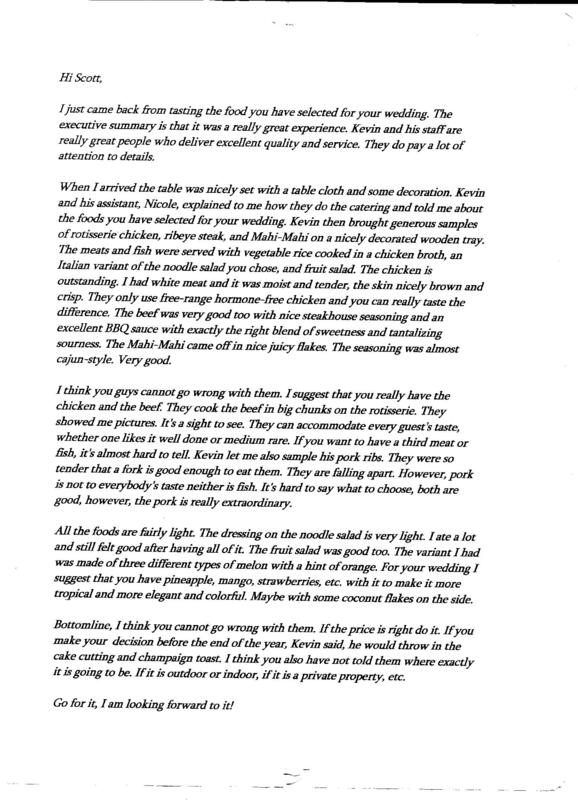 My family and friends raved not only about how delicious the food was, but how friendly Kevin and his team were. We had a small wedding of 50 people, and the RAC team were professional, helpful, and provided excellent service, while also feeling like old friends who were a part of our family that day. Their DJ, Tim, was amazing!! He was very responsive to texts and emails, and we were able to speak on the phone prior to the wedding to talk about what music we liked and didn’t like. Tim took the list of songs and preferences I gave him and ran with it, adding other songs that fit in well with our preferences and were a hit with us and our guests. Tim also came out onto the dance floor to teach me and my friends some dance steps that were a hit! He was so friendly and personable, and did a great job with helping to keep the schedule of the evening going, from giving the microphone out during our toasts, to announcing when we were having our first dance, cutting the cake, etc. Kevin, Tim, and the entire team truly made our wedding amazing. Highly recommend them for your wedding, or any event! Thank you for all your support with this year’s event. Your donations and contributions helped us meet our fundraising goals and had a positive impact on the HD Community by raising awareness about this devastating disease. We are looking forward to your continued support as we take steps in a positive direction. We are determined to one day find a cure! Thank you again for your support – we could not do this without you! Thank you for your support in helping raise awareness of Huntington’s Disease! We could not have done what we have done these past couple of years without the support from local businesses like you! Every little donation makes a HUGE DIFFERENCE!!! Hi Kevin and Terry. Norm and I want to tell you that you made our day go so smooth and perfect. Your staff from the servers to the bar staff were awesome they did a great job. The food just amazing, not one complaint for any of our guess. In fact tons of compliments. 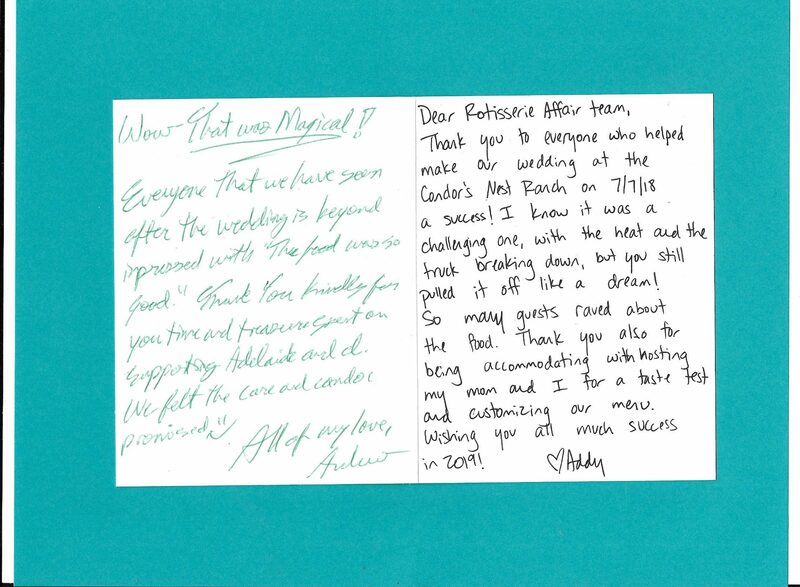 We are so happy with all you and your staff did. Thanks again. I have to tell you how wonderful everything was. 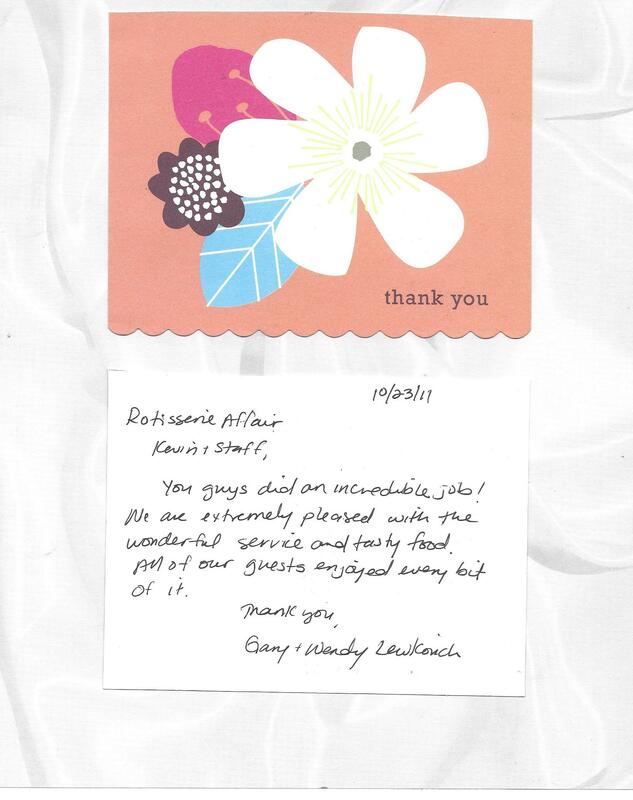 Your staff is amazing and the food was spectacular. Everyone was raving about everything. 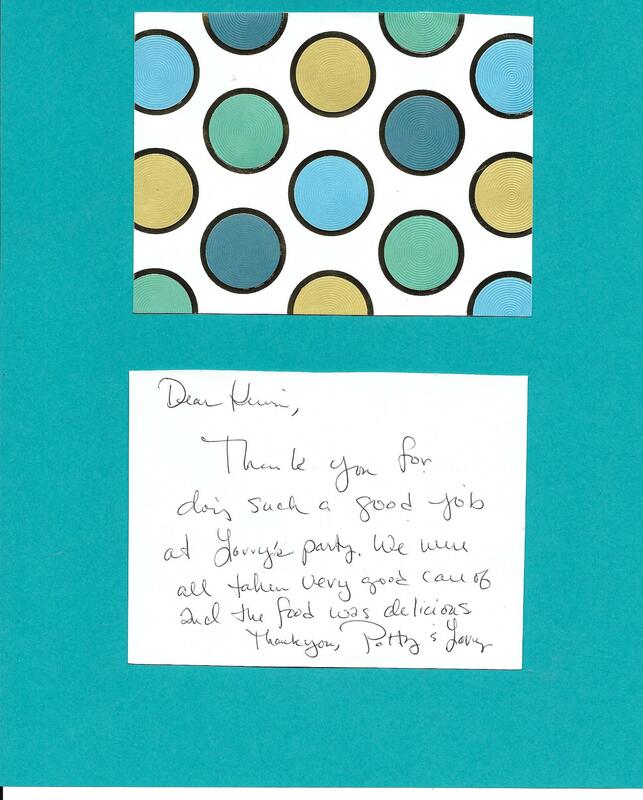 Thanks for making our party such a success. Your help was very much appreciated. If we ever have another opportunity to host an event in your area we won’t hesitate to use your company. Greg and I want to thank you and Kevin so much! The reception was absolutely beautiful and the food was amazing! ! Have to admit, Greg and I were a little disappointed there were no leftovers 🙁 All of the guests raved about the food! Bartending too was fantastic, you guys did a great job, thank you very much. You guys helped make our wedding all we hoped for and more. It was neat that you guys had the videographer there, we didnt know that was going to happen. Can we please get a copy of that video? Again, thank you so very much. On behalf of San Diego Zoo Global, I wanted to take a moment to thank you for your generous partnership which contributed towards the success of our 35th Food, Wine & Brew Celebration. We’re pleased to announce that the proceeds from this year’s event raised more than $300,000 which will benefit our 150+ conservation efforts in 36 different countries around the world. San Diego Zoo Global is leading the fight to end extinction. As a leader in conservation, our work includes on-site wildlife conservation eforts at the San Diego Zoo, San Diego Safari Park, and San Diego Zoo Institute for Conservation Research as well as our international field programs on 6 continents. As a small token of appreciation, we’ve enclosed tickets for you to personally experience the San Diego Zoo or San Diego Safari park. Visit endextinction.org to learn more about global conservation efforts and how you can become a Wildlife Hero. On behalf of everyone here at the San Diego Blood Bank, thank you for your in-kind donation of the gift certificate to our annual auction, which will be held in coordination with our “Haunting Affair” event at the US Grant Hotel in October of this year. Your donation will help us raise much needed funds for our lifesaving programs and services, including equipment, testing and bloodmobiles. Our special events and auctions build awareness in the community about the San Diego Blood Bank’s need for charitable gifts as well as blood donations. Donations to the San Diego Blood Bank through “A Haunting Affair” will insure that when donated blood is needed to save or prolong a life it is available to whoever needs it regardless of their age, race or socio-economic background. Thanks for a great BBQ! You and your crew were super friendly and helpful. Well done. I would like to thank you and your team for helping my dad and I put together a successful surprise birthday party. The prime rib was a hit and everything else was delicious! In addition, Eddi, Yanna, and Chelsea did a really great job! They were very efficient, professional, and most of all friendly. The three of them represented your company well and really helped to make our event a memorable one. Again, thank you and we look forward to celebrating another event with Rotisserie Affair.